With the Wholesale Hero app, it is possible to set customized shipping rates for your customers. It is very easy to set up specific shipping conditions according to your preference. Note: To take full advantage of this feature, please make sure that your Wholesale Hero app has the latest version. Set a flat shipping fee for the order based upon an order's total price or total weight. Add an additional shipping fee for the order based upon an order's total price or total weight. Provide a shipping discount for the order based upon an order's total price or total weight. A shipping line item labeled "Wholesale Rate" will be applied to the order at checkout. An additional line item labeled "Wholesale Shipping" will be applied to the order at checkout. An additional discount marked as "Shipping Discount" will be applied to the order at checkout. Step1. 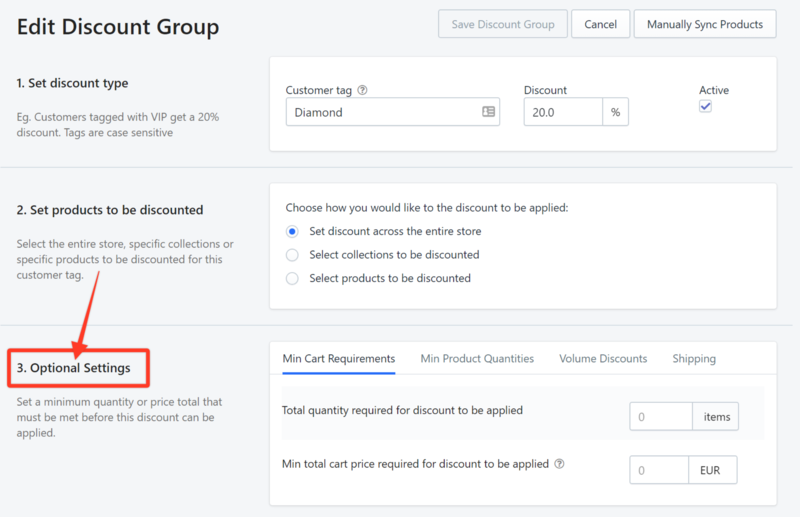 From the Dashboard on your Wholesale app, choose a discount group by clicking its Edit button. 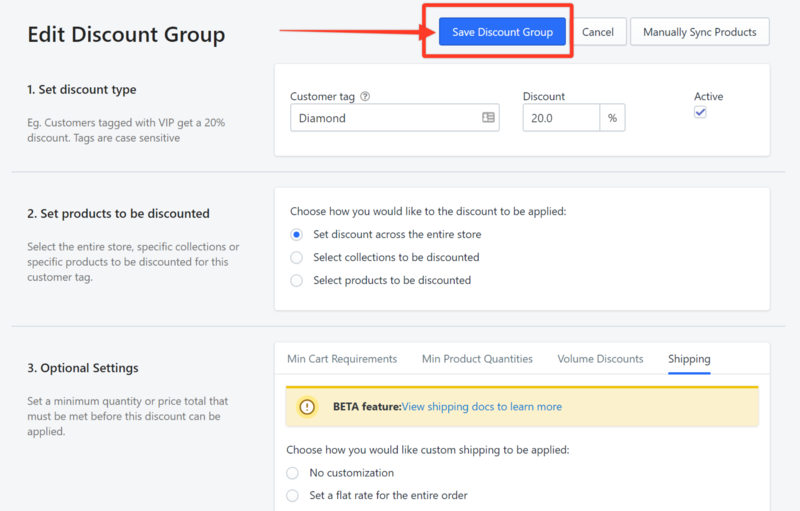 In this example, we choose a discount group with the Diamond tag. Step3. Click the Shipping tab. Step4. Choose among the three options how you would like custom shipping to be applied. In this example, we choose Add or subtract against regular shipping. Step5. Click the drop-down arrow whether to add or subtract shipping charges and specify the amount or percentage based on the conditions. In this example, we choose to add 5% shipping fees based on the total price of the purchase. Step6. Set the conditions for the additional shipping fee to apply. In this example, we are setting a 5% additional shipping fee if the total amount of purchase is not more than 500 or if the total weight exceeds 1000 grams. Step7. Click Save Discount Group.